Default class settings for your organization are edited from the Tools menu > Edit Settings. At the top of the page that opens, you'll see a section named Organization Defaults. These settings can also be accessed from the Organization Defaults item on the left menu. Scroll down for the Class Settings section. Setting this to Yes will have an email confirmation automatically sent to the primary instructor whenever a student is enrolled into a class through Online Registration or through the Parent Portal. When enrolling a student from within the database you will be prompted with an option to email the instructor. If the Send Enrollment Email to Instructors setting = No you will not see the prompt to email when enrolling from within the database and no emails will be generated for online and portal enrollments. This setting determines if enrollments with a future date are allowed. 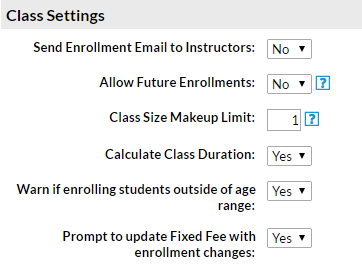 Set Allow Future Enrollments to Yes to allow for registrations with enroll dates in the future. 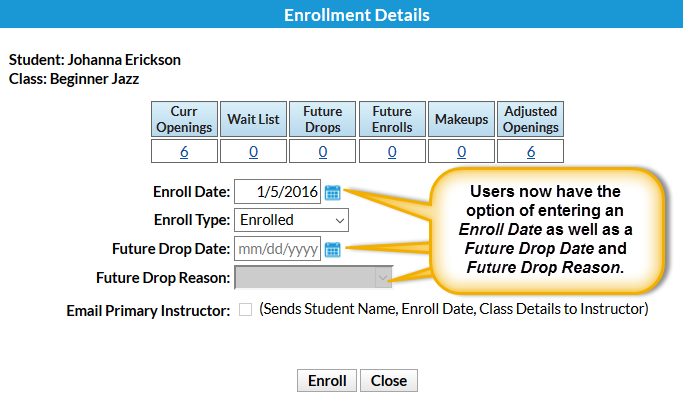 When Allow Future Enrollments is set to Yes, a date field choice is available when enrolling. Learn more about Future Enrollments in the Future Enrollment section. When your database is set to track absences (which is the default) you can schedule a makeup for a student with an eligible absence. The Class Makeup Size Limit controls how many 'extra' spots in a class you allow for makeups. If you do not want makeups to exceed the maximum number of students allowed in the class as per the Class Max Size on the Class record, set this to '0'. If Class Size Makeup Limit = 0, only 1 makeup can be scheduled (1 opening in the class). If Class Size Makeup Limit = 0, 2 makeups can be scheduled today (1 opening in the class plus 1 absence). Learn more about working with makeups in our Schedule a Makeup article. This setting controls whether or not the Duration field on the Class Summary tab is automatically calculated when the times are entered. Set this to No if you want to manually complete that field, for example, to set this to 1 and count the class as one unit regardless of the length of the class. Set Warn if enrolling students outside of age range to Yes to provide a pop-up warning for a Jackrabbit User when a student is being enrolled into a class that is outside the min / max age range. When a family or student has a Fixed Fee in place Jackrabbit can alert you when a change is made to enrollment so that you can update the Fixed Fee. Set Prompt to updated Fixed Fee with enrollment changes to Yes to be alerted that the student being enrolled has a student &/or a family Fixed Fee and to have the option to adjust the fees. Learn more about Fixed Fees in the Fixed Fees (Tuition) section.